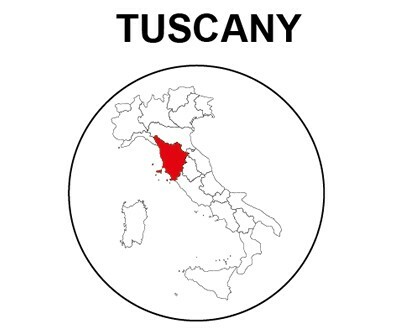 La Spinetta's Tuscan Estate lies in the village of Terricciola, between Pisa and Volterra. Here the Rivettis make wines from three indigenous varieties: Sangiovese, Colorino and Vermentino. The most prestigious wines are the single-vineyard Sezzana and Sassontino, crafted from 100% Sangiovese grapes coming from more than 50 year-old vines. As Sezzana and Sassontino are wines with an incredible life span, the Rivettis release both as Riservas and only after 10 years. Ciacci Piccolomini d’Aragona is one of Tuscany’s famous and most respected estates. It is located near the picturesque town of Montalcino, on the unspoiled hilltop of Castelnuovo dell’Abate. The uniqueness of the estate is marked by colorful hills, valleys of red and yellow flowers, ripening olive trees, and the fascinating history of three families dating back to 17th century. The Palazzo, erected by Bishop Fabvis de Vecchis of Sant’ Antimo Abbey in 13th century and auctioned by the church to Francesco Ciacci in 1877, is the oldest part of the estate. In the midst of all this architectural and natural beauty lie the vineyards of Ciacci Piccolomini.